Why are my waves not spawning as expected? The needed solution I need all 22 waves to re-spawn in order correctly as only having 4 waves repeat is very repetitive and boring. The following has nothing to do with the question, but I couldn't format the code in a comment. This prevents you from having to write out manual getters and setters for common methods, and prevents you from having to do bad design, like telling unity to serialize a private field. 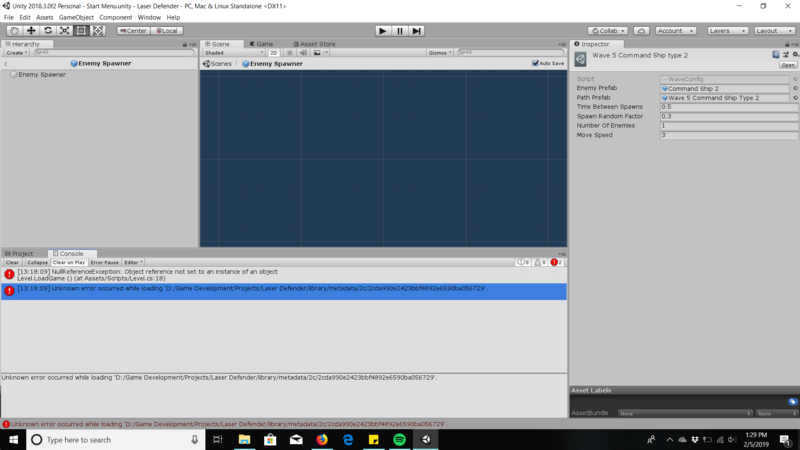 Hey guys so the issue happened to be that my enemy spawner prefab became corrupted somehow and after I replaced it with my saved source code, everything is working correctly, and oddly enough the master code from the course I built the game from had the same issue but if you are following along to the course just make sure to have all your needed prefabs in the game scene. Not the answer you're looking for? Browse other questions tagged unity c# or ask your own question. How can i make fade in/out of the alpha color of a material from black to none black? Why when drawing a box using LineRenderer the connected points of the lines is not complete? How do I interact ads with Unity Button?